CUMBERLAND — As Greely High volleyball coach Kelvin Hasch watched his team practice last week, he was the image of chill – leaning back in his chair and watching quietly while keeping score of a scrimmage. But ask Hasch about Maine’s new volleyball classifications and he’s not so easygoing. “It just dilutes the competition,” said Hasch, who has won nine Class A state titles – including last year – in his 16 seasons. 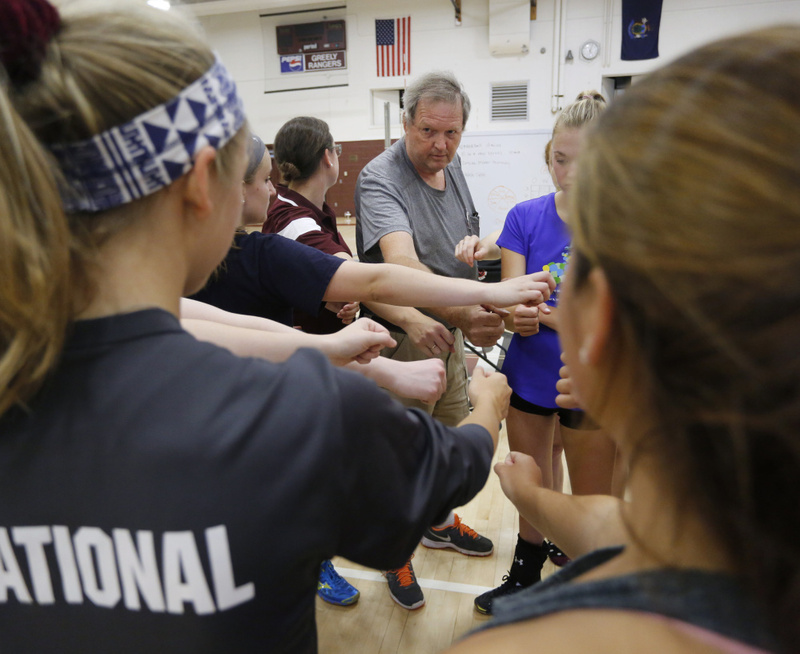 The Maine Principals’ Association expanded volleyball from two to three classes this fall, in reaction to the sport growing from 25 to 35 varsity teams over the past two seasons. Greely, because of its enrollment, has dropped to Class B. Last year there were 22 teams in Class A and 13 in Class B. This year there are 13 teams in Class A, 12 in Class B and 11 in the new Class C, which is mostly Downeast Maine schools. Hasch said two classes would benefit the sport because newer programs improve faster by playing established ones. “If you don’t play tough teams, you don’t get better,” Hasch said. Falmouth Coach Molly Northway said schools should have been reclassified on success and experience, not enrollment. “I think splitting into three classes diluted competitiveness, and growth for new and growing teams,” said Northway, who won four titles at Greely while playing for Hasch a decade ago. Scarborough Coach Jon Roberts, whose team lost to Greely in the Class A state final last year, said big-match showdowns won’t be as exciting because teams will be too familiar with opponents. Roberts also said some rivalries that developed no longer exist. “I don’t know if Greely considered us a rival but we considered them a rival. I liked the rivalries we had,” Roberts said of Class A. Other coaches point out that Class B is loaded with programs that won Class A state titles in the past five years – including Cape Elizabeth and Falmouth – and that will lift the level of play. Yarmouth Coach Jim Senecal believes reclassification will bring more excitement because the newer Class A programs will have a real shot at making the state semifinals. “Three out of the final four teams from last year’s Class A playoffs are in Class B,” said Senecal, whose team lost to Scarborough in the Class A semis last year. Cape Elizabeth Coach Sarah Boeckel said it will take Class A time to regain its competitive climate, but eventually it will.